I just had the opportunity to review the most recent release, The Story Of My Life, by Guitar Slim Jr. and it's really cool. 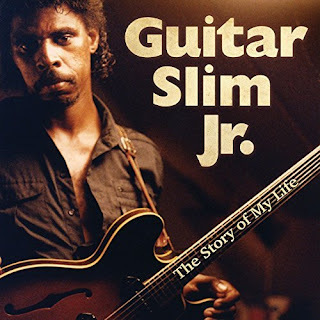 GS Jr. (Rodney Armstrong) is the natural son of Guitar Slim (Eddie Jones). Opening with a classic Guitar Slim track, Trouble Don't Last, Jr. is front and center on guitar and vocals with Shannon Powell on drums, Rene Coma on bass, Milton Batiste on trumpet and Ernest Watson on sax. Title track, The Story of My Life, has a slower tempo and Jr. shows vocal skill along with pointed guitar riffs. Very nice. On Bad Luck Blues, Jr. maintains a lot of Sr.'s sty;e but he has his own flair with stinging riffs. On classic R&B track, Can I Change My Mind, Jr. shows a much smoother vocal style and his guitar playing is jazzy and fluid with Kerry Brown on drums, Charles Moore on bass and Keith Fazarde on keys. Hot! Reap What You Sow is my favorite track on the release with strong Sr. attributes and powerful vocal and guitar work by Jr. A lot more relaxed in delivery, I Done Got Over It includes backing horn work and hand claps with nice piano work by Jon Cleary. Wrapping the release is Sufferin' Mind with an early R&B flavor. With AJ Loria piano balancing Jr.s fluid guitar runs, and warm vocals and the backing vocals of Sylvia and Oneida Joseph, this is a solid closer for a fine release.